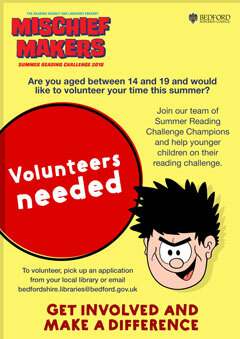 Why not become a Summer Reading Challenge Champion? Do you like the idea of volunteering with children during the summer holidays? Can you spare time over the summer holidays to chat to children about books? Go On!! Join our team of young champions in Bedford Borough and Central Bedfordshire and help younger children on the reading challenge. You'll be handing out rewards and finding out all about what the children are enjoying reading. You can also help with library activities and events in the libraries. We are looking for volunteers aged between 14 and 19 years old. Ask at your local library for more information and pick up an application pack or download one below and return it to your local library. If you have any questions then please contact us by e-mail at Bedfordshire.libraries@bedford.gov.uk or ask at your local library. The closing date for applications is Friday 6th July. We are looking for volunteers aged between 13 and 24 years old. To find out more download the Reading Hack Profile here (pdf 402kb). Please contact your local Library Manager for further information and an application form.